There are numerous business owners who are finding solutions that are helpful for them. They are mostly looking for the services that are likely beneficial for their financial matters. Nowadays, there are various financial institutions that offer you various services such as Bank Guarantee funds. But, most of the time the business owner make mistakes while selecting for a well known services. 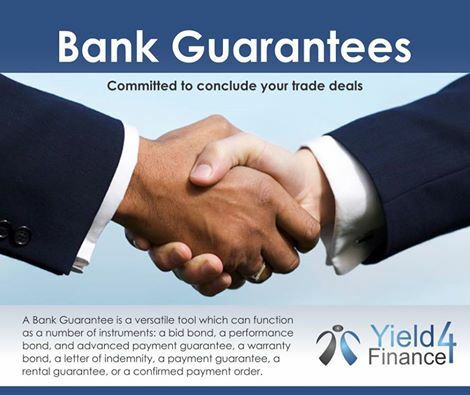 Well, Bank guarantee is a promise that is made by a Bank to cover up a loss if a debtor fails to pay on a loan. The bank generally makes the guarantee on behalf of believing clients to promise payment on loans. The guarantee provides by bank shorten the risk to loans and liabilities. There are two types of bank guarantees. The one is the direct guarantee (that is provided directly by the applicants’ bank to the guarantee’s beneficiary without including a correspondent bank) and the other is the indirect guarantee (that is provided by including the correspondence bank). Big Bond: – In this, A written guarantee from a bank is submitted to a client or customer by a bidder with a bid. Performance Bond: – this bond ensures a payment of a sum of money in case the contractor fails in the performance of the contract. Advance payment guarantee: – In this, the guarantee typically strengthens the performance of a commercial contract. Warranty Bond: – A warranty bond is especially useful when adding on to or refurbishing an existing home that ensures that the contractor will solve all issues on time. Letter of indemnity: – this letter guarantees that the contractual necessities will be met otherwise expenses will be paid. Payment guarantee: – it ensures that the price of the purchase is paid on a given time. Rental guarantee: – this serves all issues of rental agreement payments. Confirmed payment order: – in this, the bank pays the beneficiary an amount set as per the date on the behalf of the client. Knowing this about Bank Guarantee will help business owners to make their business more prosperous.